The high fashion theme of Apple Watch marketing has all but disappeared, in stark contrast with some of the publicity stunts it arranged for the first-generation launch in 2014 and 2015, a report noted on Wednesday. 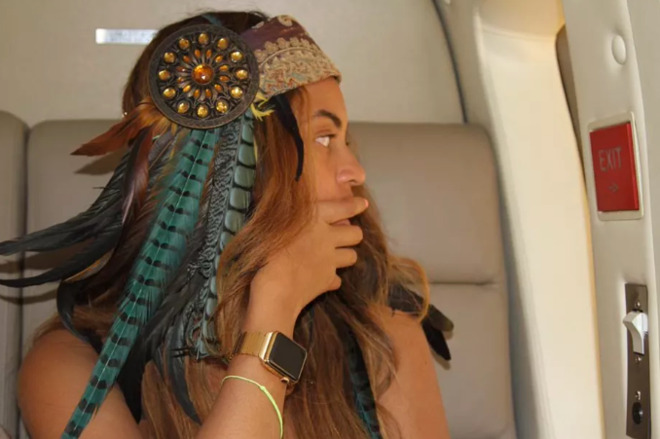 Beyonce posing with her all-gold Apple Watch Edition, customized for her by Apple. At one point the editors of Fashionista and the British edition of Vogue — Lauren Indvik and Alexandra Shulman — both flew out to a Cupertino event in the middle of New York Fashion Week, one of the biggest events in the high fashion calendar, the New York Times said. During what is arguably the most important event, Paris Fashion Week, Apple held an unveiling at the Parisian luxury boutique Colette, attended by no less than superstar fashion designer Karl Lagerfeld. When Colette began selling the Watch, there was a line of over 150 people, even though there were multiple Parisian Apple stores. One prelaunch event in October 2014 included a dinner with fashion designer Azzedine Alaia and Watch designers Jony Ive and Marc Newson. Guests included executives, designers, and editors from brands like Balmain, Vogue, and Comme des Garcons, as well supermodels Cara Delevingne and Rosie Huntington-Whiteley. Even celebrities unrelated to fashion were there such as musicians Mick Jagger and Lenny Kravitz. Apple hired multiple executives from the fashion world, such as Tag Heuer's Patrick Pruniaux, Yves Saint Laurent's Paul Deneve, and most notably former Burberry CEO Angela Ahrendts, who with Ive helped redesign Apple stores to be more fashion-focused. That aesthetic remains in place, but Deneve, Pruniaux, and even Ahrendts are no longer with the company. The first-generation Watch famously (or infamously) included an ultra-expensive Edition model starting at $10,000, thanks to its use of real gold. In some cases Apple handed custom Editions with all-gold bands to celebrities like Lagerfeld and pop star Beyonce, a tactic to ensure the Watch was talked about and envied in the right circles. 2016's Series 2 saw the Edition switch from gold to ceramic though, dramatically lowering its cost, and Apple dropped the Edition line entirely for 2018's Series 4. The company does still have two fashion options — Nike and Hermes — but even Nike is more about fitness than style, and Hermes models don't come anywhere near the cost of the gold Edition. For most people, the only fashion aspects of the Watch they now encounter are Apple's seasonal band updates and third-party band options. Many are likely content with the bands that ship with the device. Beginning with the Series 2, Apple's design and marketing focus has increasingly shifted towards health and fitness. The company frequently calls attention to the Watch's ability to detect atrial fibrillation, and the Series 4 includes an ECG sensor. Serious runners and weightlifters can pair a Watch with a chest strap for maximum heart rate accuracy. Rumors regarding a "Series 5" Watch have only started to emerge — but it's believed that Apple will try to add yet more sensor technology, workout options, and a return to a ceramic model.